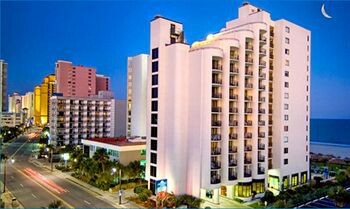 Property Location A stay at Meridian Plaza places you in the heart of Myrtle Beach, walking distance from The Children&apos;s Museum of South Carolina and Captain Hook&apos;s Adventure Golf. This beach hotel is within close proximity of Chapin Memorial Park and SkyWheel Myrtle Beach.Rooms Make yourself at home in one of the 94 air-conditioned rooms featuring kitchens with refrigerators and stovetops. Rooms have private balconies. Complimentary wireless Internet access keeps you connected, and cable programming is available for your entertainment. Conveniences include separate sitting areas and microwaves, as well as phones with free local calls.Rec, Spa, Premium Amenities Enjoy recreational amenities such as an outdoor pool and an indoor pool. This hotel also features complimentary wireless Internet access, wedding services, and a television in the lobby.Business, Other Amenities Featured amenities include express check-in, express check-out, and multilingual staff.